The new Apple policy on in-app purchases has now caused the Kindle, Kobo, and Nook ebook stores found in the applications to close down. You can still buy books outside the app though. 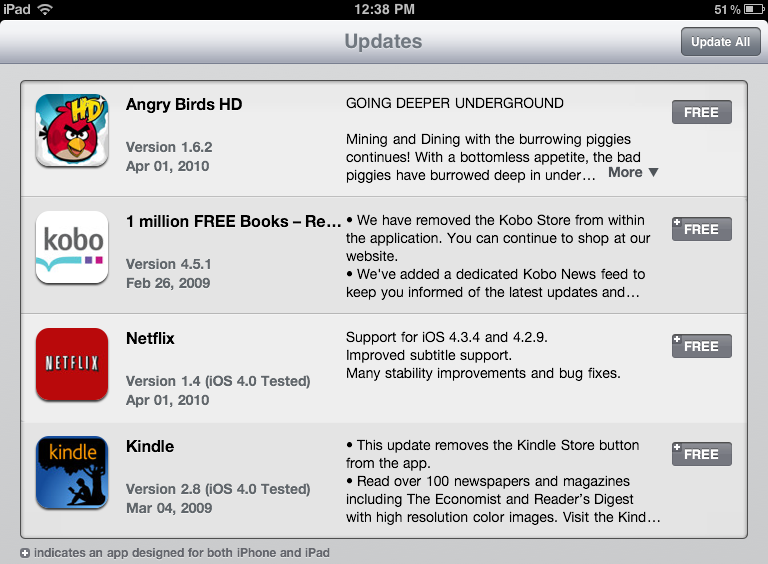 We have been receiving press releases for ebook apps that are getting updated to comply with Apple’s in-app purchase policy and as James reported the Kobo and Nook apps were updated first. GottaBeMobile confirmed that the Kindle app was also updated so now you have to purchase ebooks outside of the applications. Apple was going to take 30% of the cost of each ebook sold through these ebook stores and with ebook margins already slim there was no way these ebook vendors could accept that. I now wonder if people will find it better to just go with something like a dedicated Nook, Kobo eReader, or Amazon Kindle eInk device. Maybe this will spur more people to buy ebooks from the Apple iBooks store. It isn’t that huge of a deal to use a web browser and purchase ebooks from these stores, but it does add another few steps to make ebook purchases. I moved to reading more books on these dedicated devices and really only read on my smartphone or tablet if I don’t have an ebook reader with me. For times when I want to sit and read for a couple of hours though these eInk readers are what I go to since the experience is so much better than an application on a mobile platform. Thanks to Jason Perlow for the screenshot below. Will this Apple policy change have any effect on your iPad reading experiences?